Emory Department of Medicine medical residents are moving ahead in their medical careers after a successful Internal Medicine Fellowship Match. 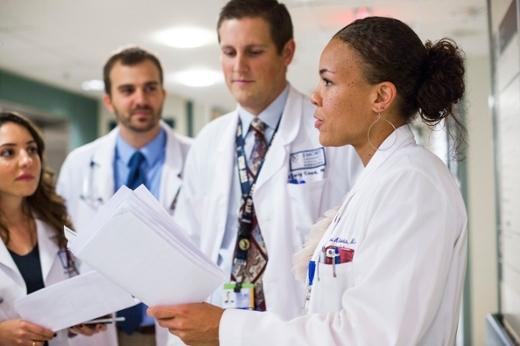 The annual Fellowship Match is part of the National Resident Matching Program (NRMP) Specialties Matching Service, which generates Fellowship Matches in more than 60 medical subspecialties. A fellowship is the period of medical training in the United States that a physician may undertake after completing a medical residency or specialty training program. During this time, the physician is known as a fellow. Emory's residents matched 15 fellowships in cardiology, eight in gastroenterology (GI), four in infectious diseases, three in hematology/oncology, two in palliative care and one each in allergy and immunology, geriatrics, pulmonary/critical care and rheumatology. "We're extremely pleased with the results of this year's Fellowship Match. Matching 15 candidates in cardiology and eight in GI, two of the most competitive subspecialties, was a major achievement," says Karen L. Law, MD, associate vice chair of education in the Department of Medicine and program director of the J. Willis Hurst Internal Medicine Residency at Emory. "It's also a nice mix of residents staying at Emory but also moving on to top programs nationally, which reflects the excellent reputation of our training program for producing highly desired graduates." Fourteen residents will complete their fellowships at Emory University, where they will receive state-of-the-art education and training. Others will be moving on to top-ranked programs across the country.